Learn how to enjoy the meditative relaxation of Modern Meditation. In his third installment of the Colourtation series, Dr Stan Rodski again draws on the study of neuroscience to bring brand new exercises and patterns to help focus your brain and create a meditative state. With over 75 patterns, Dr Rodski's easy-to-use meditative techniques are designed to focus your brain through the use of colour with pattern, repetition and detail - and this time with a focus on helping us to be more rested, concentrate better, and be more aware. The simple act of coloring itself has the power to engage your brain, improve your mood and kindle creativity by providing a mindful task that also transports us back to a time in our lives when we felt carefree and safe. And it's a mindful activity that brings no element of competition or failure which is very rare for us today. It does however create total absorption in a creative activity - even if you are not creative. 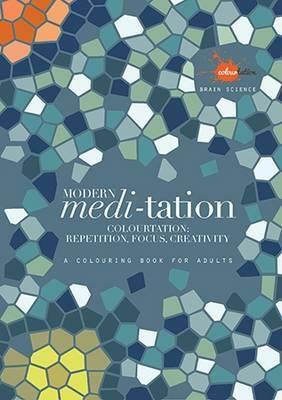 Allow the mind to relax and enjoy the meditative effects of Dr Rodski's colouring exercises as just the antidote needed to guide people towards a more harmonious life. Dr Stan Rodski worked as a psychologist for over 30 years. He is currently involved in neuro scientific research around the issues of stress and how best to deal with it in our personal, family and work life. He first qualified as a registered psychologist in 1985 and completed his doctorate in bio science in 1994. Most recently he had been applying brain science research to areas such as improving sleep, fatigue and stress, and energy revitalisation and management. This research has led to a number of programs that he facilitates all over the world, and the Colourtation book series was first available through these programs where its success in creating a calming effect was initially recognised and established. Dr Rodski has worked with individuals, sporting teams and many top 500 companies in Australia and internationally.